Most homeowners install floodlights not only to illuminate their home exterior but also to deter potential intruders. Traditional floodlights often include sensors that turn the light on when movement is detected. But if no one is at home to see the lights come on, no one will be able to secure the house — unless your floodlights have eyes. 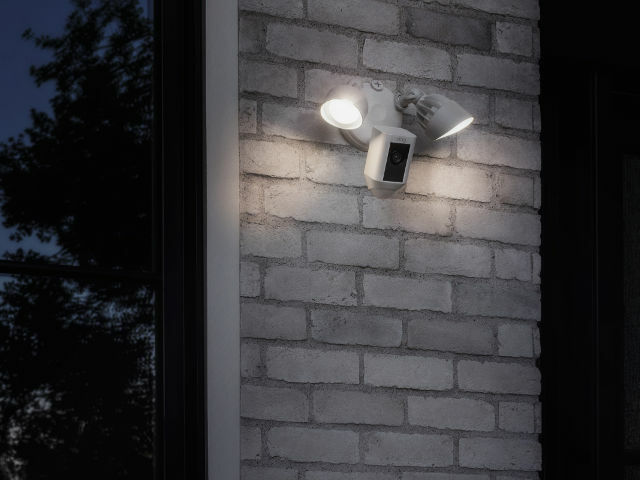 First shown at the Consumer Electronics Show 2017 in Las Vegas, the Ring Floodlight Cam is an outdoor home floodlight that lets you see what's going on. It comes with a full HD 1080p video camera, Wi-Fi connectivity, cloud recording, high-volume speaker, 100-decibel siren, smart LED lights and infrared vision (night vision). Even with all this, you can easily get it up and running yourself, even if you don’t hold a degree in engineering. There's no need for rewiring; this floodlight uses existing wiring. When the Ring Floodlight Cam detects movement within its 270-degree detection zone, the floodlight turns on and the camera begins recording live footage. You'll receive a push notification on your mobile device when that happens. Watch the live video feed even when you’re miles away, and speak to whoever caused the sensors to trip. If you see an intruder, spook them by activating the siren, speaking over the built-in loudspeaker or causing the light to pulse rapidly. It’s an effective way to attract your neighbors’ attention, too. Even if no motion is detected, you can turn the floodlight on or watch the live feed at any time, and you can configure the light to turn on or off automatically at certain hours. All this can be controlled through the same Ring app that controls the Ring Video Doorbell and Stick Up Cam, both of which work well with the Floodlight Cam. The Ring app also integrates with popular smart lights. Together with smart locks on your doors, it can beef up your home security whether you’re at home or not. The Ring Floodlight Cam is available for preorder from www.ring.com for $249. Orders begin shipping in early April.